Tunis, Tunisia – Higher Institute of Computer Science of El Manar ISI was named the Enactus Tunisia National Champion during the one-day event at the Palace Hotel in Tunis. 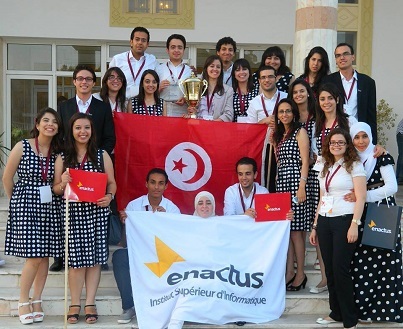 This is the second year the team will represent Tunisia at the Enactus World Cup. The 20-member team was also a national champion in 2012. This year the team highlighted two projects that included an effort that created a production and distribution channel for local foods and crafts made by housewives, and one that focused on helping struggling entrepreneurs develop an organic products business. The awards ceremony was attended by His Excellency Jens Uwe Plötner; Wafa Sayadi Makhlouf, chairman of Enactus Tunisia; Hardy Ostry, permanent head of Konrad-Adenauer Stiftung; and Jihen M’rad, ESF program administrator at the U.S. Embassy in Tunisia. Throughout the event, each of these leaders touted the importance of Enactus as well as the economic, social and environmental impact each team was making in their community and beyond. A special thank you to event sponsors Konrad Adenuaer Stiftung in Tunisia, Sodexo, KPMG and Webmangercenter and for media coverage by Business News, Radio Express FM and National TV.